They were high school sweethearts. As young adults, they went their separate ways and enjoyed full and successful lives. Personal circumstances shifted and changed. They re-connected and it was like no time had passed. Last Friday evening in Tacoma, with their four children standing as their witnesses and joined by a thrilled group of family and friends, Terry and Traci inspired all of us with their heartfelt story, generous hearts, compassion and sense of humor and fun. It was important to Terry and Traci to appropriately honor and include their children within their ceremony. We did so. They wanted a ceremony with a bit of tradition and humor. They got it. Most of all, my sense was they wanted a lifetime moment to fully celebrate the gratitude they feel to have this opportunity to fully share life in all ways. Yes, ditto. 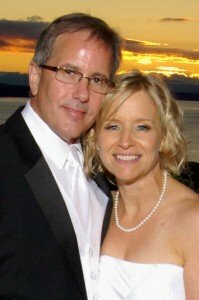 Terry and Traci – much happiness to you as you live out your love story in California with beach picnics, new adventures, the joy of family and friends and so much more.